"How many of our leaders and top officers who say that every school is a good school put their children in ordinary schools near their home? (Only) until they actually do so are parents going to buy (it)." Those were the exact words of Jurong West Secondary School (JWSS) vice-principal Pushparani Nadarajah, who was responding to speakers and teachers’ discussions of making every school a good one at the inaugural AsiaEducationExpo (AEX) 2013, according to a report by The Straits Times. During the first panel discussion, which was attended by about 200 participants, several educators expressed hope that parents would recognise the efforts of all schools to bring out the best in students. The neighbourhood school’s vice principal’s startling remark drew applause from those who attended the event. A 37-year-old mother, who has a primary-school-going child and another child attending pre-school, who did not want to be named, told Yahoo Singapore she agrees with the vice-principal's comments. “Look at the ministers, most of them are from good schools, like SJI and Hwa Chong,” she said. Blogger Michelle Wee, 38, is a mother of six children aged 1 to 15, with five of them studying in different primary and secondary schools, including elite and neighbourhood schools. She told Yahoo Singapore that she and her friends were just talking about the same topic last week. They noted that most ministers send their children and grandchildren to elite schools such as Nanyang Primary School. And Wee understands where they’re coming from as she sees a big difference in the programmes offered and resources provided for elite schools and the rebranded “heartland schools”. She cited an example of how differently Co-Corricular Activites (CCAs) are being conducted in the two types of schools. “In an elite school, they have so much (more) money; they are able to hire the best coaches and the ratio of the coaches to the students is very low. In neighbourhood schools, they don’t have the extra money. Sometimes, neighbourhood school coaches are the parents,” said Wee. She added that students from elite schools are also able to go for more excursions as “a lot of support for elite schools comes from the alumni and parents who are wealthy”. Academically, Wee also feels that students in elite schools are able to immerse in an environment where their peers are from more educated and well-exposed families as compared with students in heartland schools. Still, she says, it’s not doom and gloom for the education scene in Singapore. “(Education Minister) Mr Heng (Swee Keat) is going in the right direction, definitely. What they have to do is instead of striving to make every school a good school, which is impossible and not all children are born to fit into the academic code, they should make every school special in its own way,” said Wee. Wee also suggested having schools specialise in something that everyone can benefit from, such as having a school that is “enquiry-based”, “being more hands-on” and “nature-based” rather than just having niche programmes such as “robotics and archery”. Meanwhile, on social media, netizens are hailing Pushparani as a hero. Well said, Jurong West Sec VP! 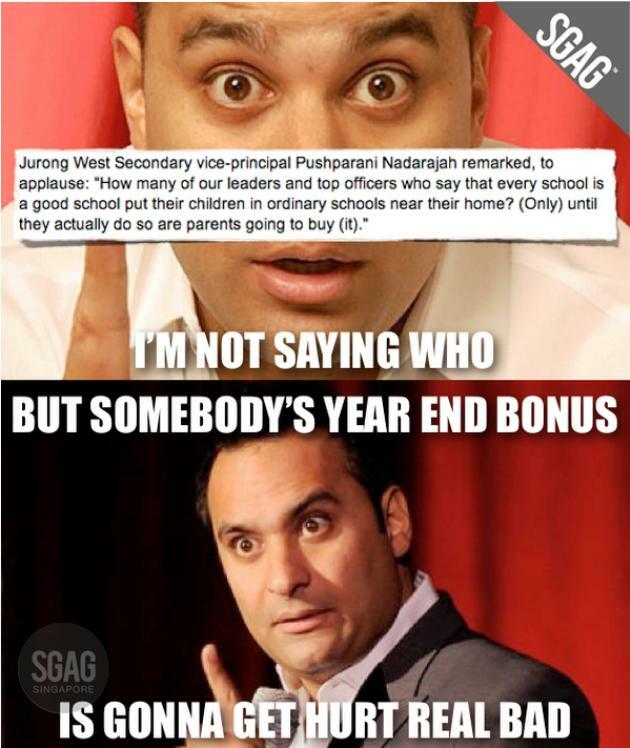 You gotta hand it to the VP of Jurong West Secondary. Memes are also being generated and some of them are going viral. Some are even calling for Pushparani to run for the 2016 General Election. JWSS is a government school located in the Pioneer region in Singapore. According to its website, its 3.1ha premises, built at the cost of S$20 million, house up-to-date facilities such as computer and science laboratories, media resource library, IT resource rooms and special rooms for art, music and dance. For the 2012 GCE ‘O’ Level Examinations, 95 per cent of the school’s pupils from the Express course and 75 per cent of the pupils from the Normal Academic course qualified for the polytechnics. Some 41 per cent of the Express course pupils qualified for junior colleges. The three-day education exhibition organised by Sphere Exhibits - the events, roadshows and exhibitions arm of Singapore Press Holdings - showcases the latest education technologies and methodologies for educators and policymakers from the region.